BRP took the covers off its 2015 Ski-Doo MXZx 600RS race sled this past weekend at the Hay Days event. According to BRP, changes include refined engine and drive systems and improved overall durability. 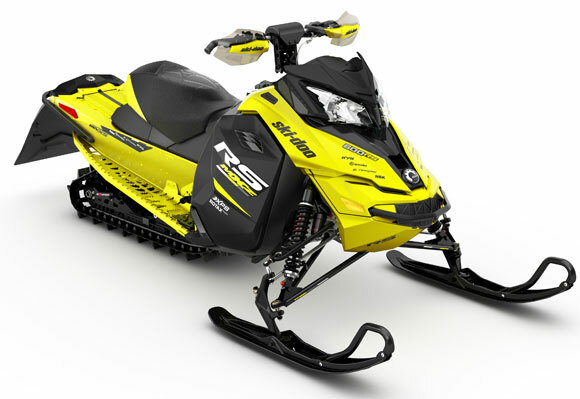 Last season saw big chassis changes for the Ski-Doo race sled like the new front suspension, steering and longer 128″ track. This season BRP says the Valcourt Race Shop concentrated on getting more power out of the engine, and then transferring that to the snow for better starts and corner-to-corner acceleration. Improvements come from a one-pound lighter crankshaft that allows the engine to build RPM faster, and calibration changes in the ignition and fuel mapping for a stronger mid range pull. New software programs developed in late season testing and Open Mod engine development have also yielded better consistency in different humidity and temperature environments. Working in conjunction with the engine changes will be a new track design that incorporates a new pattern for better acceleration. Testing showed the new track to consistently provide between one half, to one full sled length advantage at 60 feet. As well, BRP says tighter tolerances in the slip gear assembly will assure all the power gets to the ground. Scheuring Speed Sports: Tim Tremblay, Lincoln Lemieux Warnert Racing: Johan Lidman, John Stenberg BOSS/HUBER Racing: Darrin Mees, Colby Crapo, Adam Renheim, Marica Renheim Team Bauerly: Chase Rosemeyer, Marcus Johnnson, Shane Sewell, Kurt Bauerly Goodwin Performance: Brett Nastala, Eddie Neubauer, Garret Goodwin Anderson Racing: Camryn Anderson, Korbyn Anderson, Kyle Anderson Independents: Kevin Wallenstein, Braydon Love, Maxime Taillefer, Samatha Tarnowski, Cole Manning, Casey Boylan, Cody Daudt, Victoria Hawley, Megane Brodeur, Jake Tijan, Cody Steinhaus, A.J. Stoffle, Jeff & JJ Vollenweider, Tyler Slimmon. CSRA National Series London Recreation: Ric Wilson, Devin Wilson, Kyle Ward, Blake Taylor Barnett Racing: Colton Barnett, Dylan Barnett, Mitchell King, Alex Cecco, Brittany Thompson, Ryan McIver. Bailey Motorsports: Stuart Hunt, Ryan Hunt, Stale Eggen, Matt Sarracini, Christian Sarracini, Adam Goodale. Independents: Renaud Alexandre, Brandon Kuehn, Riley Bear, Joel Paquette, Lee Butler, Yanick Boucher, Alex Ross, Jordan Szachury, Scott VandeBorne. Hill-Climb RMSHA – Scott Thompson, Mark Thompson, Mike Thompson, Scott Cheeney, Ty Free, Justin Jacobson, Carl Kuster, Steve Martin, Tom Roby, Josh Koreski, Jon Norman, Clay Coleman, Shaun Moran, Luke Bledsoe, Garret Easton, Delmar Suter, Nate Suter, Bart Butcher, Ben Cilersek, Rick Haglund, Alicia Martin, Blaine Mathews, Jay Mentaberry, Mitch Sherman, Brad Sharp, Trent Hansaker, Michael Humphrey, Danny Johnson, John Jenkins, Kelly Parkinson, Ty Parkinson, Jessica Turtur, Patrick Trujillo, Brandon Michu.